We are offering you a complete choice of products which include Battery Monitoring Systems such as BattMon Pro Battery Monitoring System and BattMon Basic. 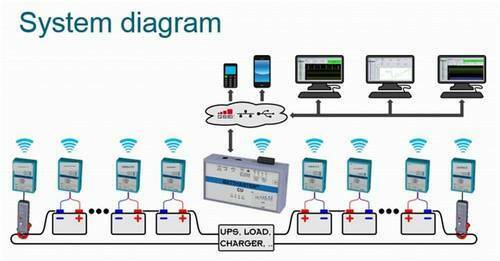 To improve reliability of back-up systems and plan maintenance activities, this Battery Monitoring System from Goabtel - a combination of hardware and software - is used to measure voltage, temperature, load current and discharge currents of the batteries. Its advanced reporting system ensures that live alerts on the status of each battery in the bank is provided as an alarm, visual indication, PC alert and SMS. The system comprises of the battery bank that is connected to Gloabox through sensors, which in turn is connected to a PC. With the Gloabox checking the parameters with set limits as per requirements, alongwith reporting of violations as programmed, the PC continuously collects data from the Gloabox. Sensors to measure voltage, current and temperature, direct link between sensors and processing units, data logging facility as well as serial connectivity to PC / server for logging and reporting are the key system components. Whether to monitor multiple banks at one location or singular banks across a geographical spread, local as well as remote monitoring and operations are convenient options available. Similar in capabilities to the BattMon Pro, the BattMon Basic is a miniature and cost effective Battery Monitoring System, very useful in case of small sized battery banks or where cost is a constraint. Due to its miniature size, it is easily portable and can be conveniently shifted from one battery bank location to another.